There are seven emotional stages of grief. Or five, depending on which version of it you wish to accept. In this issue, Batgirl and the Birds of Prey deal with them to some extent, although the emotions the “big death” scene created in me were quite the opposite of the shock, denial, pain or guilt the characters experienced. Instead, I felt rather happy about it because the character who dies is the most hated character in this series. So in a strange way, for the first time in a long time, it’s worth saying a big “Thank you” to the creative team for wiping this character out of the series. That it came on Valentine’s Day too makes it seem like the perfect gift – at least for me. Cleaning up the streets of Gotham never seemed easier for the Birds of Prey. 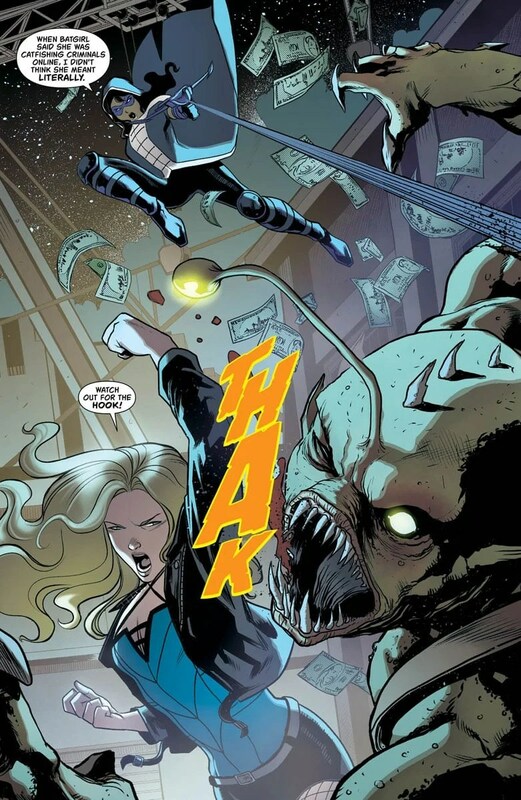 Thanks to Barbara Gordon – Batgirl – returning to her days as computer hacker Oracle, she’s able to hack Calculator’s criminal network. Using Calculator’s own system against him, she lures countless minor criminals into a trap in order to stop crimes pro-actively. But at what cost? Barbara questions the illegality of her vigilante actions but feels justified that she’s doing what’s necessary to protect those she cares about. Okay, so it’s not meant to be a good thing that this character dies. In fact, it’s apparently meant to be a great tragedy – or at least that’s how it’s presented. The irony is that this character died as they lived: as little more than a dull plot device. Still, I’ll take a win where I can get it. Not only that, but this issue even has some fairly decent writing in it… at first. 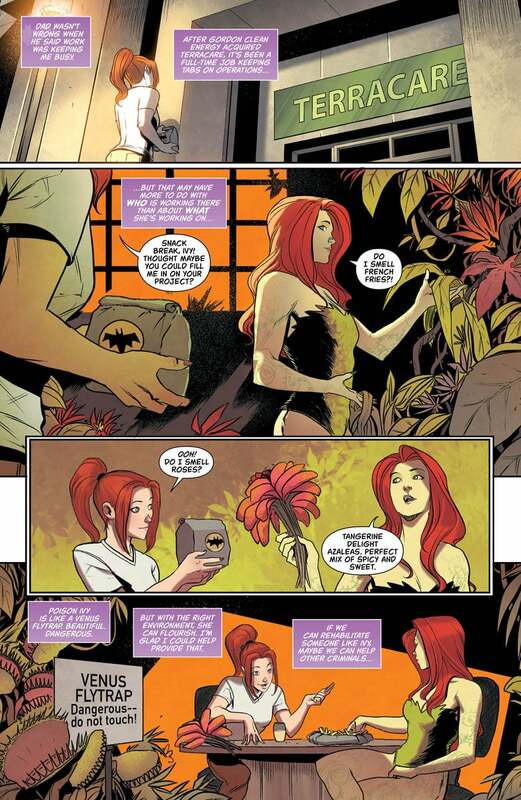 It’s been a while since we’ve seen Barbara Gordon actually make any sort of meaningful statement, and here she gets to narrate (again) why she does what does. It’s routine, but it’s good seeing her debate the ethics of her crime-fighting career. Sadly, it all devolves the minute the plot kicks in properly and the Birds of Prey fall into a trap just like the ones they’ve been setting themselves. With a Terminator knockoff literally gunning for them, the story falls apart rapidly. The Birds of Prey begin spewing ridiculous dialogue, make faulty leaps of logic and exhibit bizarre levels of hypocrisy. As if a Not-Terminator seeking information would use lethal Gatling guns to begin with isn’t bad enough, Huntress being able to count the number of bullets one of them fires is beyond belief. Who made this robot? Well, Batgirl knows the Calculator did, because… just because. 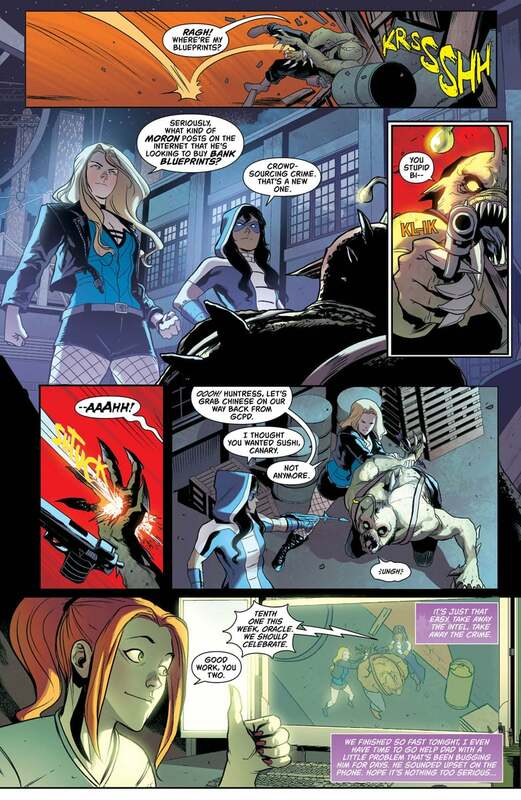 As for Huntress and Black Canary being upset with Batgirl for doing what she’s always done in her job, it makes you wonder if they’ve even met before. However, as issues in this series go, it’s… well, not great in any way, but it’s still better than the what’s sadly become the norm. Roge Antonio’s art in this issue has to be the best he’s done for the series so far too, and it’s a shame that the writing hasn’t improved to match it. While not worth the asking price, let alone your time and attention, it may offer Batgirl And The Birds Of Prey’s long-suffering fans a slight glimmer of hope.